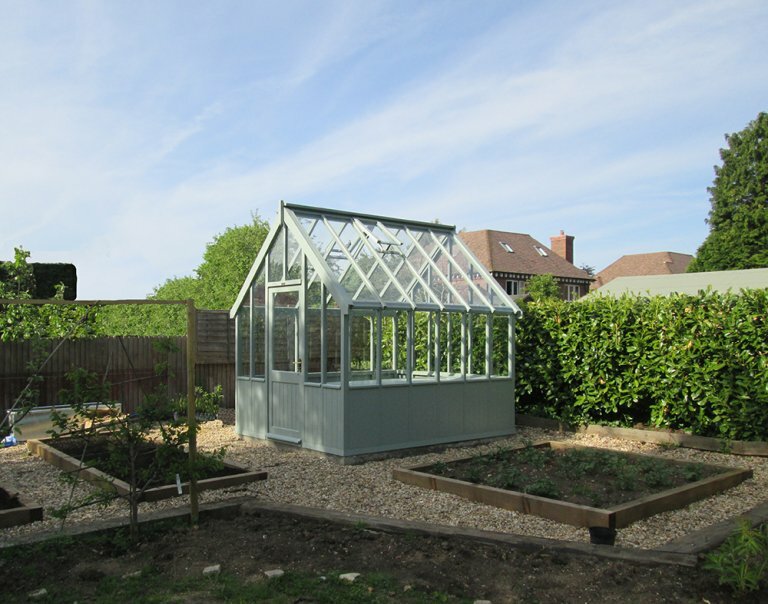 The perfect garden addition for those with greener thumbs, our Victoria Greenhouse was recently installed in the middle of a delightful vegetable patch for a customer based in Tadley, Hampshire. 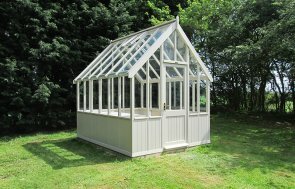 Designed and hand-crafted at our Norfolk factory using only FSC® certified timber, the Greenhouse was then both delivered and installed by our expert in-house fitting team. Measuring 2.4 x 3.0m, the Greenhouse is our medium size option, with both larger and smaller sizes also available. The customer opted to have the building painted in our tasteful exterior paint shade of Sage. Internally, the greenhouse benefits from the extra of a workbench, which increases both storage and shelving options for our customer. 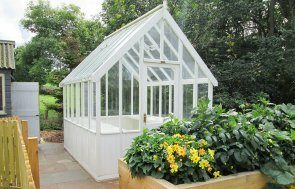 Our Victoria Greenhouses come as standard with 4mm toughened safety glass, two automatic-opening, temperature-controlled roof vents and a door with a mortice lock, with a choice of either polished brass or chrome door furniture. If you would like to browse our entire collection of timber buildings, you are welcome to visit your nearest show site, where there will be up to 25 buildings on display and a team of friendly advisors waiting to answer any questions you may have. Our nearest centres are located at the Hillier Garden Centre in Windlesham, Surrey and at the Hillier Garden Centre in Newbury, Berkshire. Alternatively, you can get in touch with us to speak to one of our experts from the comfort of your own home.